Begins October 3rd and finishes October 17th in Antananarivo, Madagascar. AIRFARE: Our flights specialist estimates the cost of the airfare to be approximately $1,800 Canadian departing Vancouver to Antananarivo via Paris & returning via Paris. Tonight we arrive in Madagascar’s capital and transfer to our hotel. Overnight in Antananarivo. Colbert Hotel or similar. No meals. Today we explore Madagascar’s capital, known simply as “Tana”. We drive to the Royal Hill of Ambohimanga, a UNESCO World Heritage Site, consisting of a royal city and an ensemble of sacred places. The Queen's Palace here is a symbol of the Merina Kingdom, the dynasty that made Madagascar a modern state. This is a place of pilgrimage and the burial ground for its sovereigns since 1817. Sitting atop the highest hill in Antananarivo, it offers spectacular views of the surroundings. We then drive down to Independence Avenue and Anosy Lake. Here we get a good picture of the diverse communities that come together from all over the island in the capital before we take a scenic drive to Marozevo. We visit the famous exotic animal breeding centre owned by naturalist Andre Pereyras, where we see almost all the chameleon species of Madagascar – as well as butterflies, leaf-tailed geckos, lemurs and other interesting animals. On the RN2 “highway” east we enjoy panoramic views of the stepped rice fields and the Merina Tombs of the Highlands of Madagascar. We see villages of the Merina tribe in the rocky hills and then continue east through green and luxuriant vegetation, with stops along the scenic rainforest route in world-renowned Andasibe-Perinet National Park, seeing primary forests and lakes. Our destination, Mantadia National Park, is part of the Rainforests of the Atsinanana - a UNESCO World Heritage Site. First of 2 nights in Andasibe. Vakona Forest Lodge or similar. Breakfast & Dinner. This morning we make an excursion to the Analamazaotra Reserve to look for the largest species of lemur, Indri indri (the “Babakoto”), which is active during the day and communicates through calls that can be heard as far as 4 kilometres away! The park has 10 other diurnal and nocturnal lemur species and we hope to see the beautiful Golden-crowned Diadem Sifaka, as well as Black-and-White-Ruffed Lemurs. We should also be able to see large chameleons and many birds. This primary forest includes ferns, lichens, epiphyte orchids (which flower in October/November), medicinal plants, palms and precious woods and is critically important for maintaining ecological processes necessary for the survival of Madagascar’s unique biodiversity. This day includes strenuous walks in the rainforest. In the afternoon we visit Andasibe village, known as “the City of Waters”, and stroll through the local market to see some Malagasy craftspeople working. This area is also home to the Betsimisaraka (“The-Many-Inseparables”) community, the second largest tribe on the island, who live mainly from the forest supplemented by rice cultivation. This evening we enjoy a night walk in the Vakona Forest Lodge private reserve to observe the nightly activities of lemurs and other nocturnal animals, including Mouse Makis (makis are a variety of Lemurians also called “macacos”), Woolly Lemurs and the endemic cat called the “Fosa.” We also have a chance to canoe along the river to see different species of lemurs. Second of 2 nights in Andasibe. Vakona Forest Lodge or similar. Breakfast & Dinner. We depart early and have a full day drive through spectacular eroded hills called ‘lavaka.’ This area will remind you of Southeast Asia with its terraced rice fields, thatched houses and green landscapes of vegetables and fruit trees. We return west along the RN2 almost as far as Antananarivo before turning south onto the famed RN7. Along the way, we visit the metal workshop of Donné Vy and stop in Behenjy, a little town which is known for its production of paté de foie-gras. We also stop in Ambatolampy to see aluminium pot making. Our destination is the highland town of Antsirabe, with its wide colonial streets, volcanic lakes and colourful rickshaws. “The Place of Salt” is the centre of beer making in Madagascar and is known for its handicrafts. Founded by Norwegian missionaries in 1856, it is the only place which really feels and looks like a European city – with its elegant spa and the railway station. It has a temperate climate and so fruits and vegetables which grow in cooler parts of the world are grown here. We visit a number of the town's famed craftspeople to watch them working on the precious and semi-precious stones that Antsirabe is famous for, as well as seeing embroidery making. Overnight in Antsirabe. Couleur Café Hotel or similar. Breakfast & Dinner. Today we continue to wind our way through the Highlands’ scenic landscapes, where the houses are made with ornately-carved wooden balconies and shutters with bright colours. We stop en-route for a short visit to Lake Andraikiba. Further on we pass the ‘le col de Tapia’, a type of tree resistant to bushfires. The landscape is still dominated by very photogenic rice fields, pine forests, eucalyptus trees and rocky hills. At the Malagasy arts and crafts capital, Ambositra, we stroll through the city visiting workshops of Zafimaniry artisans – skilled sculptors working on marquetry rosewood and ebony. We also see the Zafimaniry weavers of “landikely” and “landibe” silks. This afternoon we leave the main road to reach our destination for the day: Ranomafana, a little village named after the hot springs in the valley along the side of stunning Mount Ifasina. 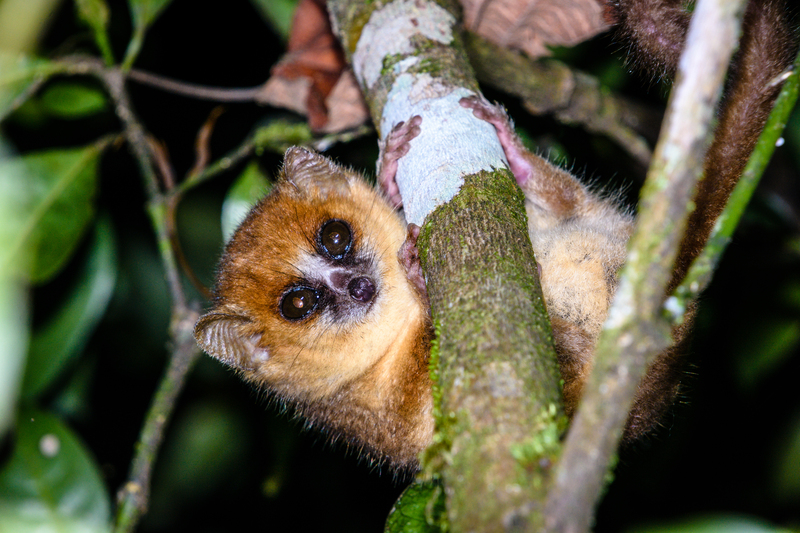 After a short rest at our hotel, we embark on a night walk to spot nocturnal species, such as the “Microcebus” – the smallest lemur in Madagascar. 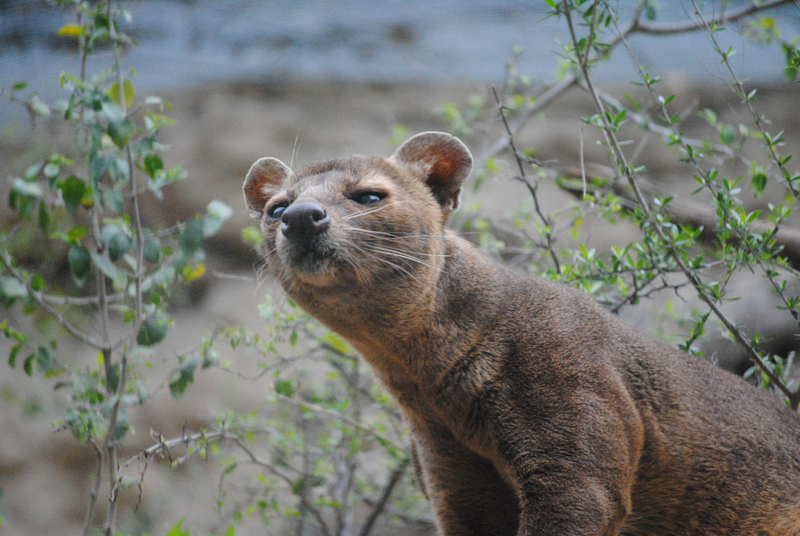 The nearby national park is one of the most important mammal sites in Madagascar. First of 2 nights in Ranomafana. Setam Lodge or similar. Breakfast & Dinner. This morning we search Ranomafana National Park’s rainforest for lemurs, accompanied by our local naturalist guide. 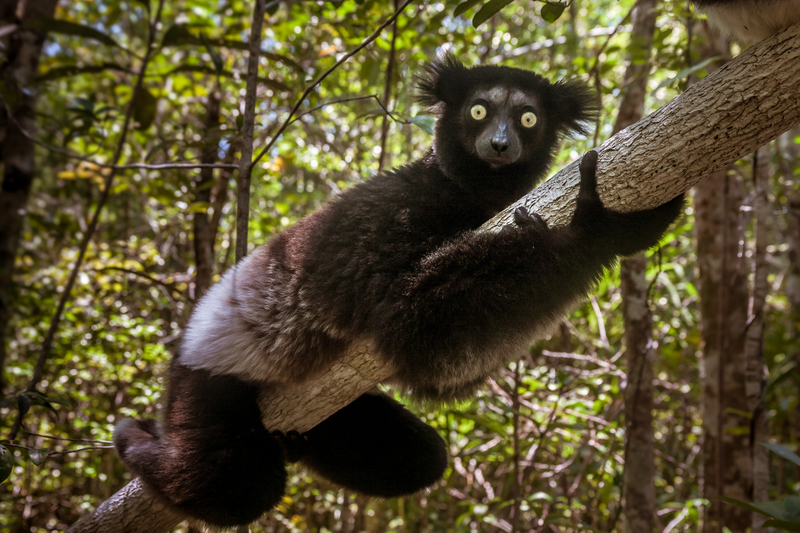 This is a high-altitude rainforest reserve where the Golden Bamboo Lemur was discovered in 1986. The forest is home to 11 other lemur species, endemic chameleons, Leaf-tailed Geckos, Mantella Frogs and a myriad of birds. We embark on a quest to see the fabled "Hapalemur aureus" – the Golden Bamboo Lemur – which is only found in Ranomafana. We will also see many different species of birds, such as Ground Rollers. The park is particularly rich in flora and features many plant varieties unknown elsewhere, including different types of orchids and ferns. The approximately 40,000 ha of Parc National de Ranomafana, with its rainforest-covered hills and abundant wildlife, has long been considered one of Madagascar’s highlights. Altitudes in the park range from 800 to 1,200 metres above sea level. In addition to its densely-forested hills, Ranomafana’s terrain is characterised by numerous small streams which plummet down to the beautiful Namorona River. Although much of the region has been logged, the park retains relatively large areas of primary forest. This day includes strenuous walks in the rainforest. In the afternoon we visit the orchid arboretum located near the village. Here we find many orchid species, but also reptiles such as chameleons and geckos. We also visit a village of the Tanala ethnic group, the forest people of southeastern Madagascar. After dinner, you can join us on an included night walk in the area around our hotel to try and spot the Rufous Mouse Lemur, the Greater Dwarf Lemur and some of the other nocturnal wildlife. Second of 2 nights in Ranomafana. Setam Lodge or similar. Breakfast & Dinner. Early departure to drive via Fianarantsoa, the cultural capital of the Central Highlands, to the pleasant rural town of Ambalavao. This is the site of one of the largest livestock markets in the South (Wednesday mornings only.) We visit a local winery and a workshop making the unique Antemoro paper, which is hand made from the bark of a local tree using a method is inherited from Arab culture. We also visit a silk factory in town and learn about the local way of making fabric from silk thread and the process of dying it with natural dyes. We then continue to Anjar Community Reserve for a short walk, during which we have the chance to see Madagascar’s iconic animal – ring-tailed lemurs (Lemurian Catta). In the past, visitors fed the lemurs, so the majority of the animals are unafraid to come near us to pose for photographs. We continue to Ihosy, capital of the Bara tribes, who are herders of Zebu cattle. Further on we pass the volcanic peaks of the Andringitra massif, which serves as a transition between the green Highlands with its very spectacular granite rock formations and the dry south. Our journey south takes us through a landscape of rock formations typical of the dry Grand South, some of which are sacred. We pass through the legendary ‘Porte du Sud’ and cross the desolate expanse of the Plateau de Horombe with its deep red soil, arriving late afternoon in Ranohira, gateway to Isalo National Park. First of 2 nights in Ranohira. Isalo Rock Lodge or similar. Breakfast & Dinner. Today we explore the stunning desert plains, deep canyons, sandstone formations, grasslands and palm-lined oases of Isalo National Park. We hope to encounter the 3 lemur species that are found here – Red-fronted Brown Lemurs, Ring-tailed Lemurs and the loping, bipedal Verreaux’s Sifaka. We will also see vegetation such as Uapaca bojeri, Pachypodium rosulatum or ‘elephant's foot’ and Aloe isaloensis, a native species of aloe endemic to Isalo. The eroded mountains also served as a place where the Bara people kept their dead before they could bury them in their actual tombs. This day includes strenuous walks. Second of 2 nights in Ranohira. Isalo Rock Lodge or similar. Breakfast & Dinner. This part of our journey continues down the paved RN7 to its end in Tulear on the Southwest coast, introducing us to new scenery among the dry forests of the west and the spiny desert of the south. We pass through the sapphire mining boom town of Ilakaka, a frontier town vaguely reminiscent of the Wild West. En-route today we see the locations of different ornate hillside ‘Mahafaly Tombs’, which were built for chiefs and kings and are covered in stones, sculptures and horns. The more important the deceased, the more horns and statues the tomb is adorned with. One of the largest tombs has over 700 horns of zebu cattle! As this is a sacred site we will just be passing by. Photography is not permitted. We also pass the area of the ‘Antandroy Tombs’. This is the driest part of the country - called the “Deep South” – where the landscape is dominated by cactus-like, spiny forests of different euphorbias. 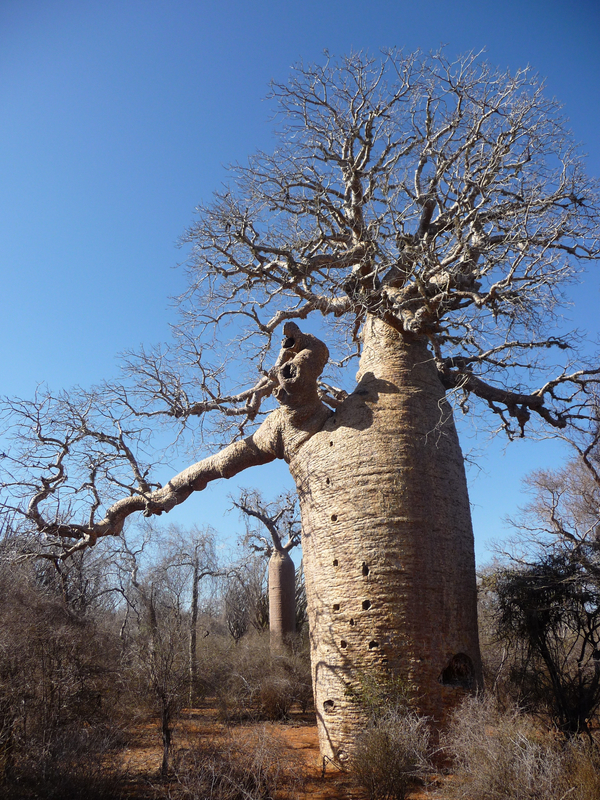 In this area giant baobab trees, which can be hundreds of years old, grow. For most of the year, these hardy trees have no leaves, so their bare branches look like roots – giving them the name “upside-down trees.” This is an area of dry and sandy soil where the local people battle to find drinking water. When we reach Tuléar (also known as “Toliara”), set on the Tropic of Capricorn, we visit the excellent Arboretum d'Antsokay, which is a 400,000-sq-metre miniature spiny forest with over 900 plant species. If time allows before our flight this afternoon, we can drive up the unpaved RN9 to the little fishing village of Ifaty with its breathtaking beaches on the Mozambican Channel. Here mangrove trees line the coast dotted with Vezo communities which earn their living from fishing. We can see many small pirogue dugout canoes with men who go out fishing twice a day, while the children and women wait on the coast to collect the fish before taking them to Tuléar for sale. Later this afternoon we transfer to Tulear’s airport and fly back to the Antananarivo, where we transfer to our hotel. Overnight in Antananarivo. Colbert Hotel or similar. Breakfast & Dinner. 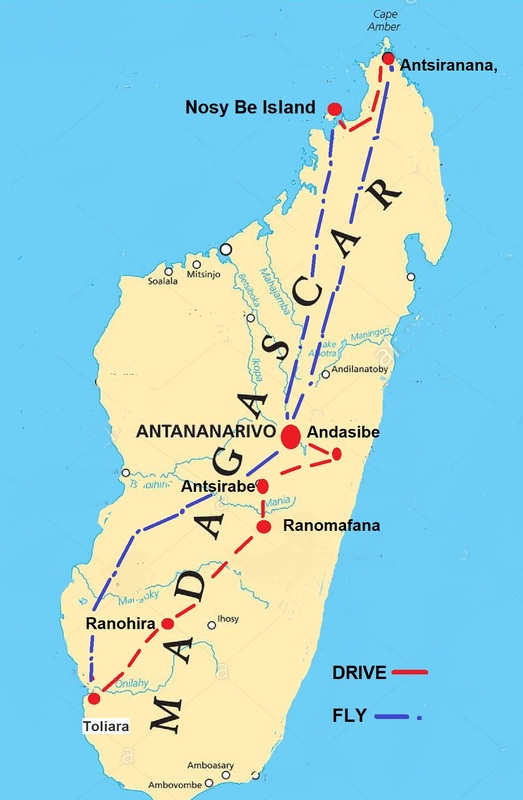 Early this morning we fly from Antananarivo to Antsiranana, also known as Diego Suarez. This major port at the very northern tip of the island has fascinating architecture and history, with wide streets, old colonial-era buildings, amazing views of the bay and a genteel air. We explore the town before visiting Les Trois Baies on the eastern side of the peninsula – a series of beautiful bays with stupendous beaches. There are many coves and inlets along this stretch of the coast, but the area is named after 3 majestic bays: Baie de Sakalava (Sakalava Bay), Baie des Pigeons (Pigeon Bay) and Baie des Dunes (Dune Bay). This is a wild and starkly beautiful environment with not a village in sight. First of 2 nights in Diego Suarez/ Antsiranana. Grand Hotel or similar. Breakfast & Dinner. From Diego Suarez we drive out to see one of Madagascar’s most impressive natural wonders, Les Tsingy Rouges (“The Red Pinnacles.”) These eroded pinnacles are formed of laterite, an iron oxide–rich soil with intense brick-red colour. These surreal formations stand on the edge of beautiful canyons, which include a breathtaking viewpoint. We can also enjoy sweeping views of the Indian Ocean. Second of 2 nights in Diego Suarez/ Antsiranana. Grand Hotel or similar. Breakfast & Dinner. This morning we drive south through the interior of northern Madagascar to the small, tree-lined town of Ambanja on the Sambirano River. This area is famous for its large cocoa, spice and vanilla plantations. From here we board a boat for the island of Nosy Be, known as “the ‘perfumed isle”, where we enjoy the “mora mora” (literally, “slowly slowly”) lifestyle. The island is paradise for water-based activities. First of 2 nights on Nosy Be. Andilana Beach Resort or similar. Breakfast & Dinner. We start our exploration of the Nosy Be area at Lokobe, a typical fishing village situated in the middle of a ylang-ylang plantation in the southeast of the island. Here we visit the Réserve Naturelle Intégrale de Lokobe, which protects most of the island’s remaining endemic vegetation. We will also see cultivated plant species such as ylang-ylang trees, vanilla orchids and travellers' palms. 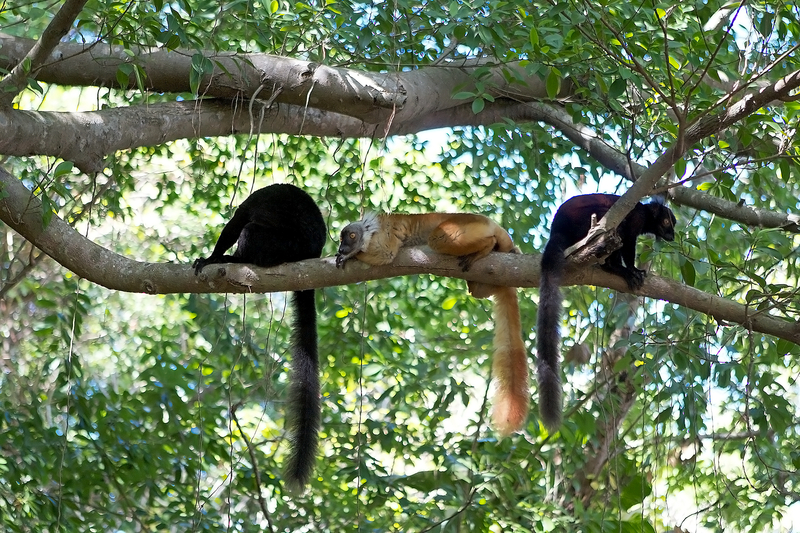 The reserve is home to the Black Lemur (the male is dark brown, almost black, while the female is a lovely chestnut colour with white tufts around her ears and cheeks) and several other lemur species. Setting off by fast boat, we visit the small island of Nosy Tanikely, which became an underwater reserve in 2010 and is known for its unrivalled snorkeling. A radius of 700 metres around the lighthouse marks the natural reserve area. Second of 2 nights on Nosy Be. Andilana Beach Resort or similar. Breakfast & Dinner. Today we fly back to the capital. Depending on our time of arrival in Tana, there may be time for last-minute souvenir purchases in the craft market of Digy. Tonight we transfer to the airport for tomorrow’s very early flight home. Very early this morning we fly from Antananarivo, arriving home the same day. No meals. - Accommodation mainly in good 4-Star hotels and lodges. All our accommodations have en-suite bathrooms and air-conditioning and/or heating as required. - Land and water transport by our own small coach, ferry and boat. - Flights: Tulear – Antananarivo, Antananarivo – Antsiranana and Nosy Be – Antananarivo. - Guiding by Royal Heights tour leaders Julie and Norman Bruce with the assistance of our expert Malagasy local guides. - Tipping for Drivers, Boatmen & Guides. - We do NOT include porterage. Porters MAY be available to help you with your suitcase and you should be prepared to tip them if you use their services. Our flight specialist suggests direct flights from Vancouver – Paris and Paris – Antananarivo with Air France and returning via Paris. You do NOT have to come to Vancouver to join this tour. You are welcome to book your own flights or we can put you in touch with our flights specialist. Please let us know. Our published price is based on 2 people sharing a room. If you wish to be guaranteed a single room, there is a Single Supplement charge of $1,540 Canadian. Those people traveling alone but wishing to share will be informed 3 months prior to departure if a roommate is not currently available. At that point, you will be invoiced for the Single Supplement. If a roommate subsequently joins the tour, your single supplement will be refunded with the final documentation. The land portion of the tour must be booked directly with Royal Heights Tours. You can secure your place on the tour with a $400 per person non-refundable deposit. We take payment by cheque, Visa or Mastercard for the $400 /person deposit. Your invoice for your Land tour will be e-mailed to you in early July. Payment will be due by August 3rd 2019. Price quoted is for FINAL PAYMENT by cheque. Should you wish to pay the outstanding amount for the LAND tour by credit card there will be an administration fee of 3% on the outstanding amount. - The roads in Madagascar are bumpy. This tour is NOT possible if you have any lower back issues. - Please bring a water bottle that you can refill. -Domestic flights can be delayed or even cancelled, so we have to be flexible! We will see all the major sites of Madagascar’s capital, Antananarivo, but we may see them on different days from those indicated in our itinerary – depending on when our domestic flights end up arriving in and departing from the city. As Madagascar is definitely a developing nation, you must be prepared for unscheduled adjustments to the program. - Please only bring one piece of soft-sided luggage per person and make sure your luggage has wheels so you can move your own luggage when necessary + one ‘carry on’ handbag. Our vehicles can accommodate only ONE piece of luggage per person. - Our office staff are NOT medically qualified to advise you on which immunizations you require. Please contact your local travel health medical centre.